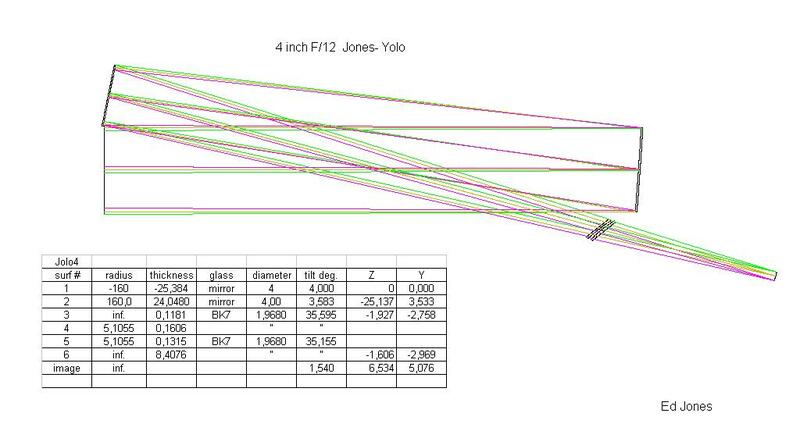 I’ve put the Chief correcting lenses in most telescope designs I could think of including the Yolo giving it the name “Jolo”. One of the difficulties of making a Yolo is the toroidal secondary mirror. Two correcting lenses can eliminate the need for a toroid or needing to warp the secondary. Surprisingly the two correcting lenses are tilted in the same direction unlike the Chief. This is because only astigmatism is being corrected. I still havent made one yet even though the spot diagrams are very good. Below is a design you can build or scale up. I found two lenses in the Ross Optics catalog that are large enough to use in a larger Jolo. I don’t know how expensive they are but the design is awesome across the visible range. It could even be scaled up twice as large if you could find the lenses.